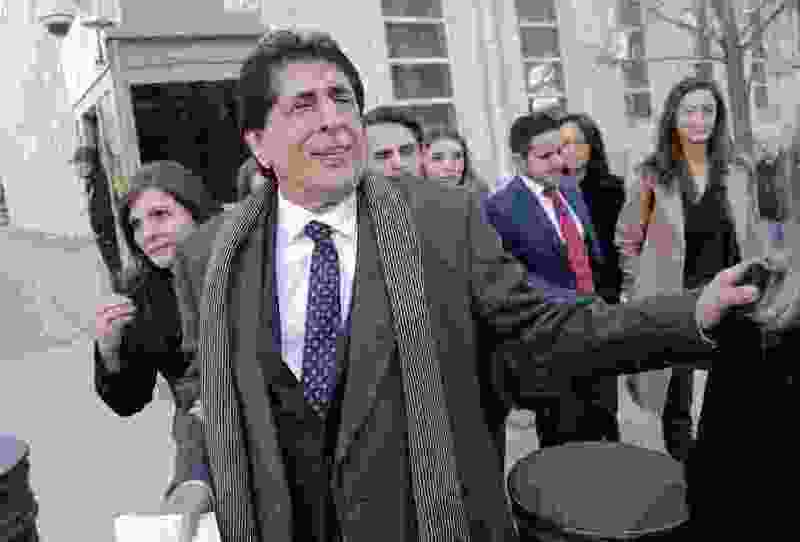 (AP Photo/Seth Wenig) Former Guatemalan soccer federation president Brayan Jimenez leaves U.S. District Court in the Brooklyn borough of New York, Tuesday, Feb. 5, 2019. Brayan Jimenez, a former head of Guatemalan soccer’s governing body, was sentenced to time served and fined $350,000 after pleading guilty for his role in the FIFA corruption scandal uncovered by U.S. prosecutors. New York • Brayan Jimenez, a former head of Guatemalan soccer’s governing body, was sentenced Tuesday to time served and fined $350,000 after pleading guilty for his role in the FIFA corruption scandal uncovered by U.S. prosecutors. Judge Pamela K. Chen issued the sentence during a 70-minute hearing in U.S. District Court in Brooklyn. Jimenez faced up to 20 years in prison for racketeering conspiracy and wire fraud conspiracy, and while Chen explained federal guidelines called for a sentence of 41 to 51 months, she concluded Jimenez's cooperation and remorse mitigated the situation. "There are no excuse and no justification for my actions," he told the court, his words translated from Spanish. "My actions have brought shame to the world of football." "Every day I've had to fight in order to not fall off a cliff," he said. "In accepting these payments, I violated my moral principles, my honesty and my honor," he said. "I've been tormented by this great mistake I made." He was charged in November 2015 as part of the second wave of indictments in the Justice Department's investigation into soccer corruption. He pleaded guilty in July 2016 to one count of racketeering conspiracy and one count of wire fraud conspiracy. The other seven counts against him were dismissed Wednesday. Jimenez's sentence showed the benefit of cooperation with prosecutors. Juan Angel Napout, a former president of Paraguay's federation and the South American governing body CONMEBOL, was sentenced to nine years in prison last summer after being found guilty at trial. Jose Maria Marin, a former president of Brazil's soccer federation, also was found guilty and was sentenced to four years in prison, ordered to forfeit $3.3 million and pay a $1.2 million fine. Hector Trujillo, the former secretary of Guatemala's federation, pleaded guilty and received an eight-month prison term in 2017 in the first sentence in the case. Chen said there was a "rampant nature of bribery and corruption in FIFA" and its constituents. Jimenez said he arranged to obtain bribes worth hundreds of thousands of dollars for himself and another federation official during negotiations with the Miami-based company Media World, later known as Imagina US. He said the money was wired from Media World in the U.S. to other people's accounts in Guatemala, and his share was then distributed to him. Jimenez said the payments were in exchange for media rights for Guatemala's home World Cup qualifiers in 2018 and '22, and for giving two individuals the right to organize exhibition games involving Guatemala's national team. "This is a very serious crime or crimes," Chen said, noting Jimenez had taken an extra $200,000 bribe that he kept secret from his co-conspirators. Jimenez, a member of the FIFA committee for fair play and social responsibility, was banned from soccer for life in April 2017 after the adjudicatory chamber of FIFA's ethics committee said he violated the FIFA code of ethics' articles on general rules of conduct; loyalty; duty of disclosure, cooperation and reporting; conflicts of interest; and bribery and corruption.